It was already 30 minutes past the hour of eleven in the morning today and I was still undecided what magic to do in the kitchen. 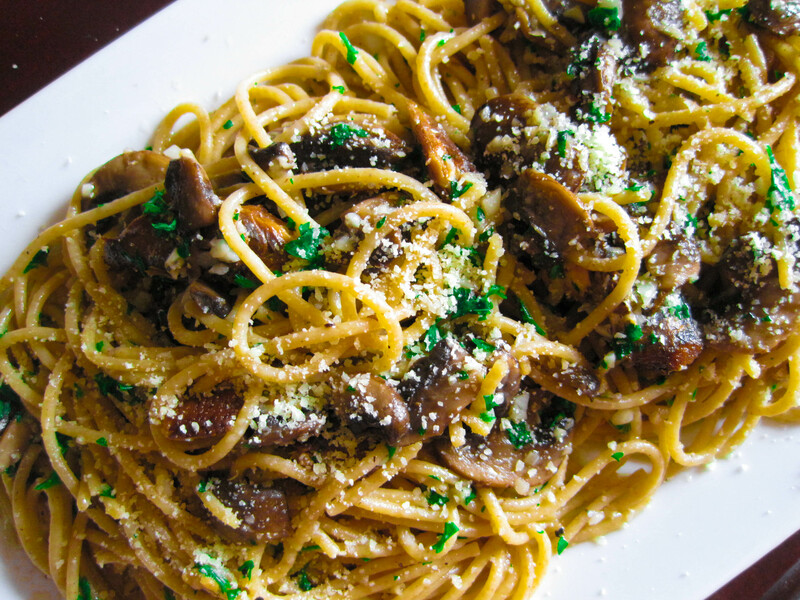 Scouring the pantry, I saw a pack of whole wheat pasta and some few pieces of portobello mushrooms in the ref. I thought it would be lovely to pair them off and seal the flavors with a hefty serving of mackerel sardines. Ahh, Sunday special– sardines and portobello mushrooms on whole wheat pasta. Lately, I have been fancying on light coated pasta noodles. Something in the mold of aglio olio, at the most, a good plate of arabiatta. Today’s pasta was a cross between alio oglio and herbed pasta with two major add-ons– sardines and my latest mushroom craze, portobello. The symphony of flavors courtesy of the garlic, sardines, mushrooms and the nuttiness of the whole wheat pasta just melted in my mouth like anything. Agaricus bosporus or commonly known as portobello mushrooms are one of the most consumed mushrooms in the world. The woodsy, fresh taste it yields loads the dishes its extra oomph. Oddly though, my kitchen help insisted that these mushrooms were something they considered “pest” in the provincial barrios along with basil leaves (which, according to her, were their pigs’ favorite food! ), tarragon leaves, scalops (which they sold for a measly fifty pesos per SACK!) and baby potatoes and corn. All certified quasi-gourmet ingredients in the metro na inapak apakan lang nila! (that they just stepped on!). Healthy, scrumptious and extremely easy to make– I guarantee you– there will be no leftovers. Now, is that good or bad? Cook pasta according to package directions. Drain and sprinkle with oil to avoid sticking of the noodles. Set aside. In a skillet, saute garlic, mushrooms and sardines. Add salt, pepper and parsley. Toss in pasta. Season some more if necessary. Top with parmesan cheese. Serve with your favorite toast. This dish is reminiscent of something I had in Venice, Italy. That one wasn’t on whole wheat though. Nevertheless, yours look much more appetizing and healthy. I’ll try to make it sometime. It’s good to see you on FB, glad you’re doing well. Candice! OMG! Is it really you? I mean, like seriously? I miss you! This looks really delish! Will try it!! Hi Karen! Yummy dish as usual! What I want to know is the place where you kitchen helper hails from… =) a sack-full of scallops at PHP50? Basil for pig food? Pesky portobellos? I wanna live there!!! You probably used a bottled kind of sardines… what specific brand did you use? Can i use the Connie’s Kitchen or Zaragosa brands available in the grocery?